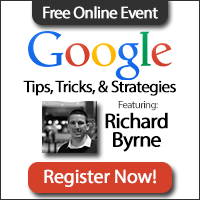 Next Tuesday, March 31st Simple K12 is hosting an afternoon of free webinars about Google tools for teachers. The webinars will start at 1pm Eastern Time and run until 5pm Eastern Time. My colleague, Richard Byrne, is conducting two of the sessions and always does a great job. These webinars by Simple 12 are always excellent and a great way to learn some new things.